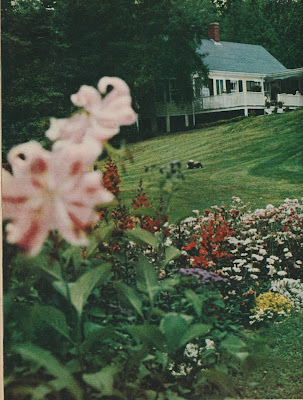 I suppose, in a way, it's fitting to end the week with photos of Sister Parish's homes in Dark Harbor, Maine. Homes is plural because, as you'll recall, she owned both a winter house in town as well as a summer place that was down the road. At first glance, it's a heady mix of floral chintzes, stripes, and patchwork. 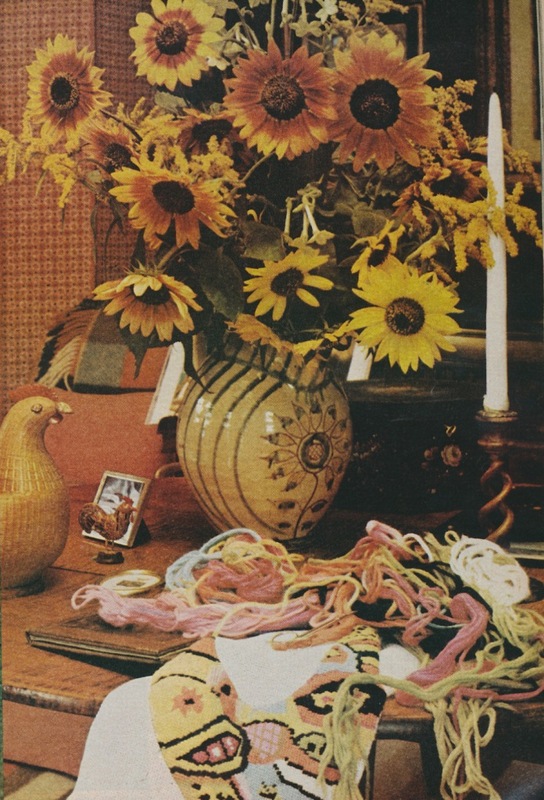 But take a good look at the rooms and you'll see evidence of Sister Parish's projects: decoupage, needlework, and floral arrangements that she attended to daily. They add such a homey touch to the interiors, don't you think? 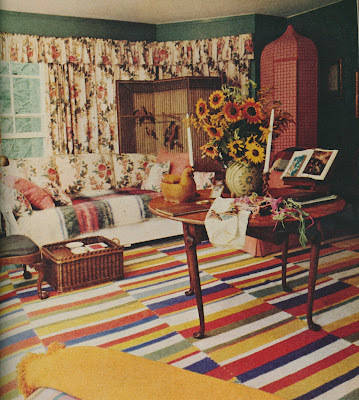 In fact, these photos make me want to take up decoupage. Well, almost. 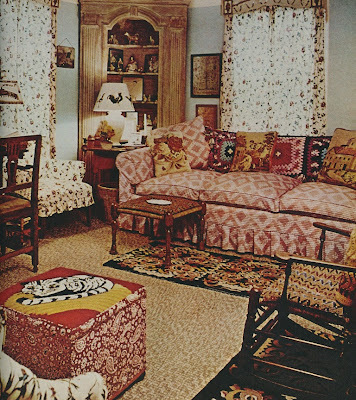 Mrs. Parish's sitting room. 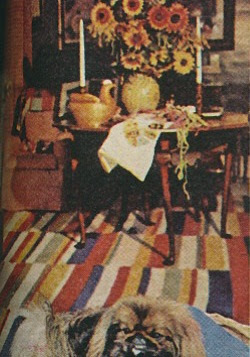 The rug was Irish made. The interesting looking corner cabinet held sweaters. No, not Yummy, but rather Desmond the Pekingese. Mrs. Parish's needlework sat beneath a faience jug of sunflowers and green tobacco leaf. The town house living room. 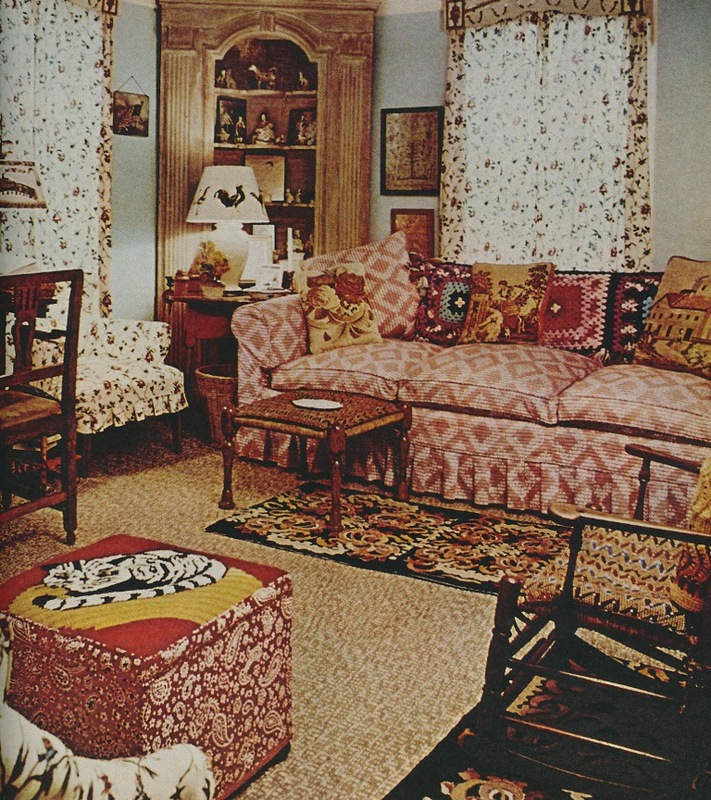 The fabric on the sofa was an Albert Hadley design. 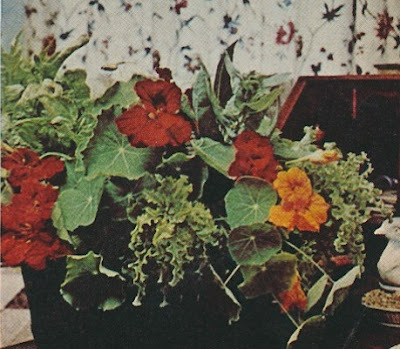 A town house arrangement of lettuces, chicory, nasturtiums, beedtops, and parsley was done by Parish's daughter, Apple Bartlett. 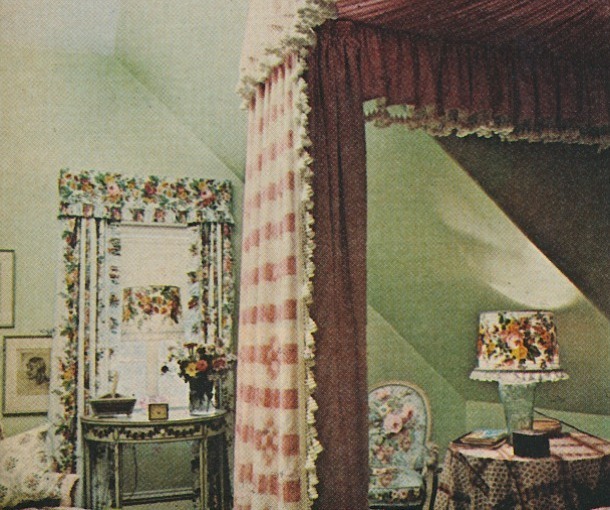 A guest bedroom at the town house. 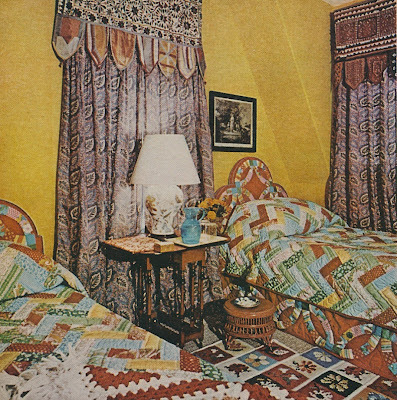 The headboards were upholstered in quilts from West Virginia, while the bed spreads, also quilts, were made in Kentucky. 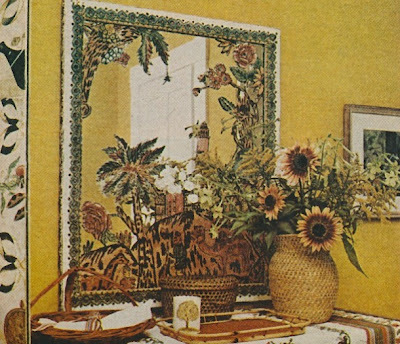 Mrs. Parish decoupaged this old mirror. Mrs. Parish's town house bedroom with its four different floral chintzes. A hallway that led from the greenhouse to the living room. 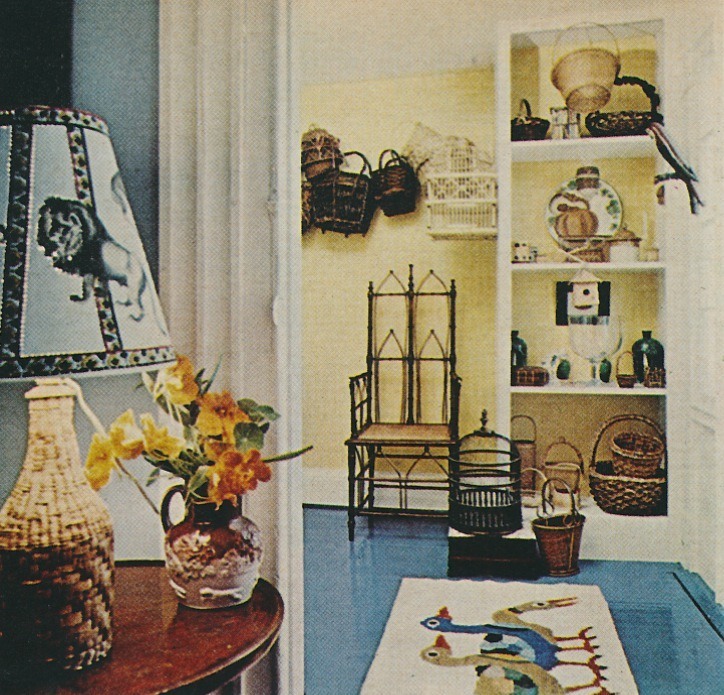 All photos from House & Garden, March 1971, Horst photographer. I wonder what became of that wonderful screen depicting caged birds seen in the second image? 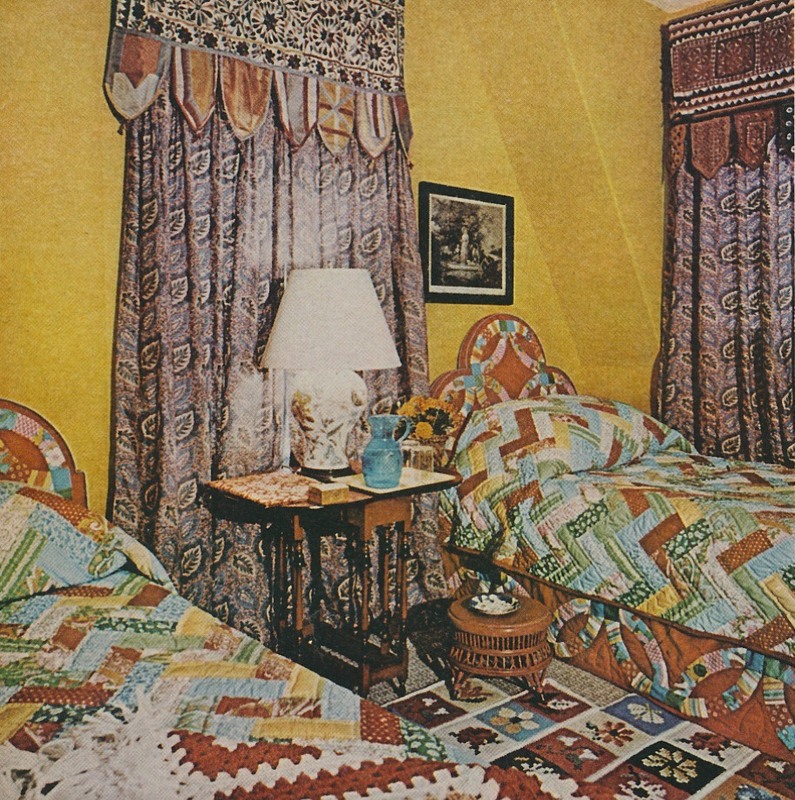 In the image with twin beds, that's a decoupage lamp (with the clipped paper glued inside the glass jar, then the interior painted). I don't wish to be negative but I feel these pictures are an argument for not taking up decoupage. That is a wonderful screen. 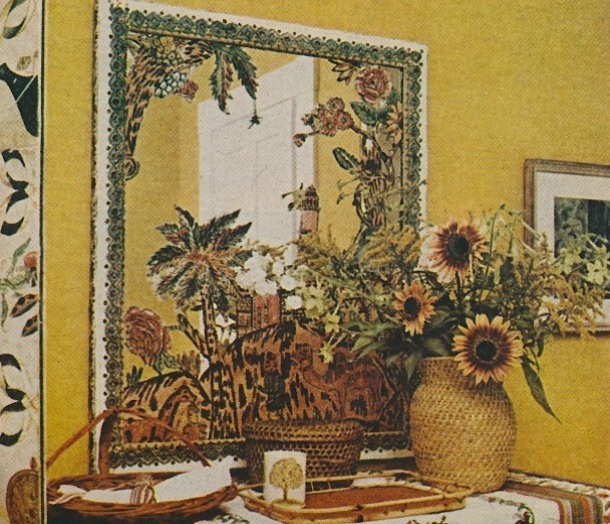 I think that the decoupage lamp is nice looking, although the mirror is a bit over the top. And who would be the person to "tea cart" the tea cart pusher? I find this all very amusing. I love this look. I think of it as "Grandmother's house". Whenever I see a room like these I think I would feel safe and warm and loved in them. Amazing how she mixed all those patterns together and somehow it worked! That is really difficult to do without it looking like a real mish-mash of random things...kudos and great pix! The folding screen with trompe l'oeil birds inside a trompe cage~now THAT is something! 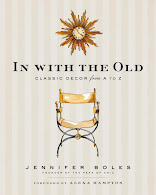 Somewhere in my stash---if I haven't thrown it out in the need to purge before moving--is spread from a magazine of Sister Parrish's big country house done with white painted oak dining furniture (she got a good price on...I think...about a hundred pieces of old oak and slapped a coat of white on it all..... upholstered chairs to snuggle up in...white painted farmhouse floors...a mix of old and new flowered fabrics....unframed paintings on the sills leaning against the windows. 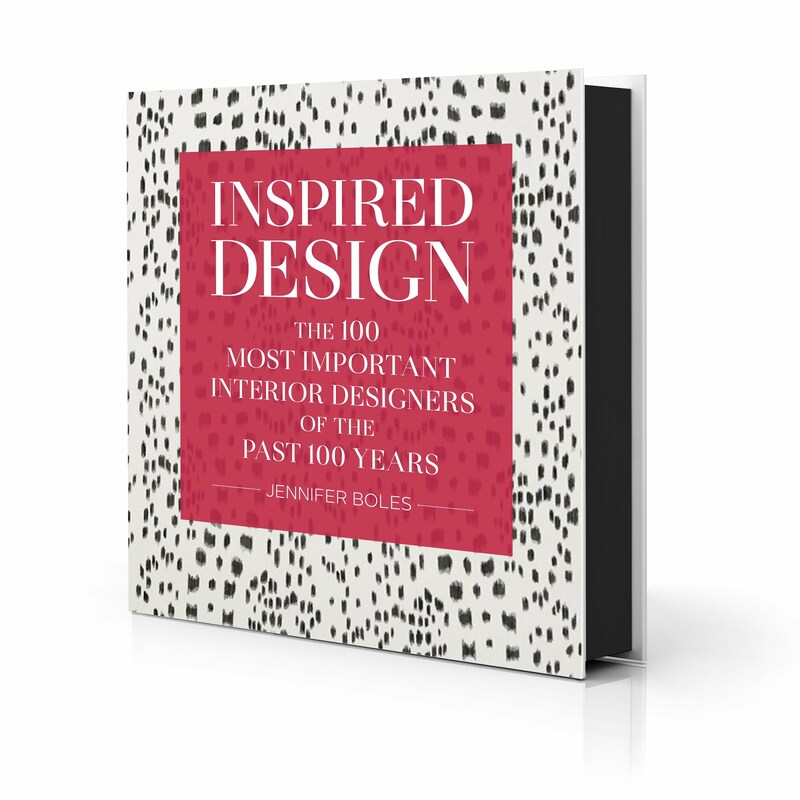 I saved these pages for almost 40 years and never managed to emulate her comfortable style.....didn't get to Italy, either, so live on with my dreams....even today, her house would be stylish and enviable.